1) Explain procedure to the patient if appropriate. 2) Connect the patient to a pulse oxymeter. 3) Prop up the patient to a semi-recumbent position, with the ipsilateral limb abducted. 5) Make proper drapping over field of interest. 6) Infiltrate the local anesthetic sufficiently, including the parietal pleura and the periosteum of the rib posterior to the line of incision. 8) Proceed with blunt dissection until the pleura is visible. 9) Now, gently and firmly, by using a blunt-ended clamp, puncture the pleura, and widened the hole created. 10) Place one of your finger into the hole to ensure there's no adhesions. 11) Insert the chest tube without trochar into the puncture hole created after clamping it. 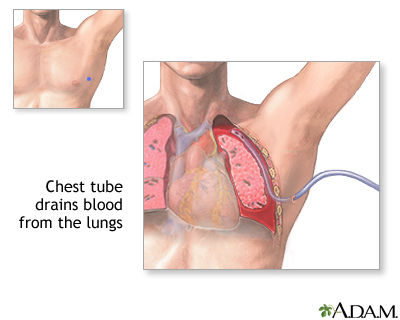 Guide the tube superiorly if it's a pneumothorax, and towards the base if it's a hemothorax. 12) Fix the chest tube using the silk sutures. 13) Connect the distal end of the tube to the underwater seal drainage bottle, and remove the clamp.